If you put your finger gently on a loudspeaker you will feel it vibrate - if it is playing a low note loudly you can see it moving. (More about loudspeakers.) When it moves forwards, it compresses the air next to it, which raises its pressure. Some of this air flows outwards, compressing the next layer of air. The disturbance in the air spreads out as a travelling sound wave. Ultimately this sound wave causes a very tiny vibration in your eardrum - but that's another story. At any point in the air near the source of sound, the molecules are moving backwards and forwards, and the air pressure varies up and down by very small amounts. The number of vibrations per second is called the frequency which is measured in cycles per second or Hertz (Hz). The pitch of a note is almost entirely determined by the frequency: high frequency for high pitch and low for low. 440 vibrations per second (440 Hz) is heard as the note A in the treble clef (the violin's A string), a vibration of 220 Hz is heard as the A one octave below, 110 Hz as the A one octave below that and so on. We can hear sounds from about 15 Hz to 20 kHz (1 kHz = 1000 Hz). A double bass can play down to 41 Hz or below, and the violin can play notes with fundamental frequencies well above 2 kHz. Human ears are most sensitive to sounds between 1 and 4 kHz - about two to four octaves above middle C.
The pitch of a vibrating string depends on four things. Thicker, more massive strings vibrate more slowly so the strings are thicker as (on a violin) you go down from the E to A to D to G strings, even though the length of the string doesn't change, and its tension does not change much. The frequency can also be changed by changing the tension in the string using the tuning pegs: tighter gives higher pitch. This is what the player does when s/he tunes up. The frequency also depends on the length of the string that is free to vibrate. The player changes this by holding the string firmly against the fingerboard with the fingers of the left hand. Shortening the string (stopping it further up the fingerboard) gives higher pitch. Finally there is the mode of vibration. When you play harmonics, you induce the string to produce waves which are a fraction of the length of those normally produced by a string of that length. For more about strings and their motion, including harmonics, see Strings, standing waves and haromonics. For their interaction with bows, see the section Bows and strings. The strings themselves make hardly any noise: they are thin and slip easily through the air without making much of disturbance - and a sound wave is a disturbance of the air. An electric violin or an electric guitar played without an amplifier makes little noise. It is the bridge and body of the acoustic violin that transmit some of the vibration of the strings into sound in the air. 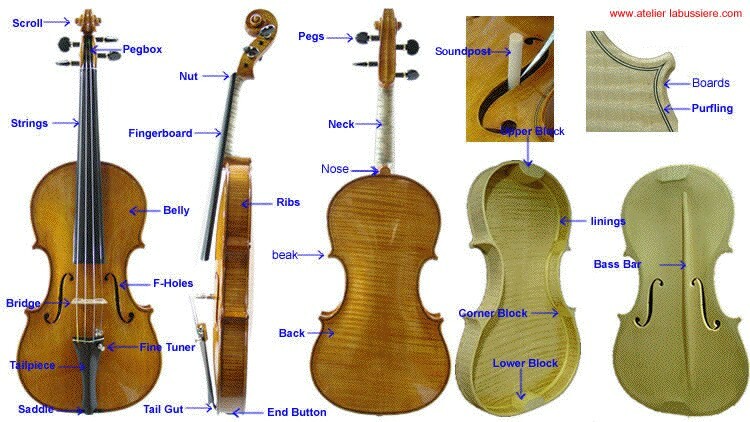 This diagram showing the anatomy and nomenclature of the violin is provided by Atelier Labussiere. The bridge transfers some of the energy of vibration of the string to the body of the violin. The bridge itself is very effective at transmitting power to the body at frequencies from about one to four kHz, which is where the ear is most sensitive. This is one of the reasons for the bright timbre of the violin.You can reduce the effectiveness of the bridge at transmitting power by attaching a mass to it - the mass is usually called a mute, and it serves to make the instrument both quieter and less bright in timbre. The bridge stands on the belly between the f holes. These holes have two different functions. One is to connect the air inside to the air outside, and we talk about this below. The other is a result of their length: the part of the belly lying between the f holes can move more easily than can most of the wood of the body. Let's see how this works. The treble foot of the bridge (the one under the E string) is quite near the soundpost, which is a small post connecting the relatively flexible belly plate of the violin to the much stiffer back plate. This post prevents the belly from collapsing under the vertical component of the tension in the strings, and it also couples the vibrations of the plates. This connection to the stiffer back plate restricts the motion of the treble foot considerably. The bass foot of the bridge is much easier to move up and down. (Press gently with your fingers and you can feel this difference.) As a result, when a string is driven from side to side by the action of the bow, the bridge tends to pivot about the treble foot, highlighted in yellow in the sketch at right. The bass foot moves up and down a little, moving part of the belly with it. The position of the soundpost (which at low frequencies is the pivot for the motion of the bridge) is critical to the sound of the instrument. Makers will sometimes move it slightly to change the response of the instrument. Small changes can have a noticeable effect. Under the belly on the bass foot side of the bridge is the bass bar. It extends beyond the f-holes and thus transmits the motion of the bridge over a large area of the belly. Cross section at the bridge, seen from the tailpiece end. At low frequencies, the bridge oscillation approximates rotation around a point near the treble foot. The body: the front and back plates, the sides and the air inside - all serve to transmit the vibration of the bridge into vibration of the air around the instrument. For this, the violin needs a relatively large surface area so that it can push a reasonable amount of air backwards and forwards. The most important part is the belly. The belly or top plate. The belly and back plates are made so that they can easily vibrate up and down. The plates have a number of resonances: ie there are certain frequencies at which they vibrate most easily. These are identified by luthiers and scientists using Chladni patterns. To make the graph at right, isolated bellies were driven mechanically at the position of the bass foot of the bridge, and the acceleration was measured. The graph gives the ratio for force to acceleration. If we were vibrating a small mass m, the ratio would be that mass, independent of frequency. However, the resonant behaviour of the plate appears here: the acceleration produced by a given force is a strong function of frequency. 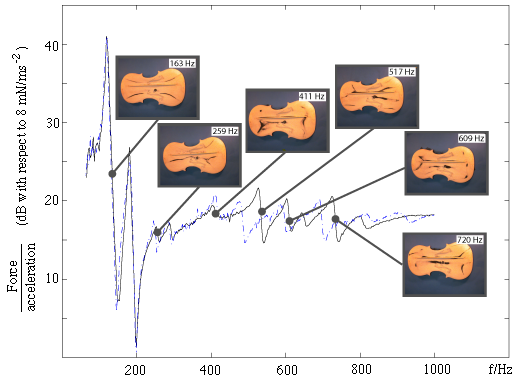 On this graph, each major resonance is indicated by an inset photograph of its Chladni pattern. The two curves here are for the bellies of two rather similar violins. When the violin is assembled, the resonances are more complicated. However, the resonances are very important in transmitting the varying force exerted at the foot of the bridge into radiated sound. The air inside the body is also important, especially for the low range on the instrument. It can vibrate a little like the air in a bottle when you blow across the top. In fact if you sing a note near D4 close to the violin, and then hold your ear close to the f-holes, you may hear the air in the body resonating. This is called the Helmholtz resonance. 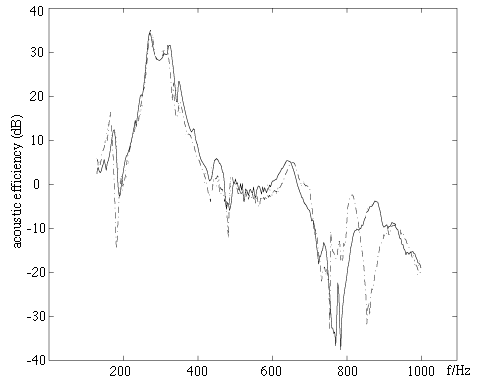 You can see the effect of this resonance at around 300 Hz in these two curves. Of both the violin and the guitar, we might say that the lowest resonance (associated with the Helmholtz resonance) falls near the pitch of the second lowest string, and the lowest body mode falls near the pitch of the third lowest. Together theseincrease the sound radiation at fundamentals of several of the notes in the low range of the instrument. Further body resonances are distributed at higher frequencies. These improve radiation of the fundamentals of higher notes, and to harmonics of lower notes. Where does the sound energy come from? We have mentioned the importance of resonances in increasing the sound output of the instrument. It is worth making it clear that the body doesn't amplify the sound in the technical sense of the word amplify. An electronic amplifier takes a signal with small power and, using electrical power from the mains, turns it into a more powerful signal. In the violin, all of the sound energy that is produced by the body originally comes from energy put into the string by the bow. The purpose of the body is to make that conversion process more efficient. In an electric guitar, very little of the energy of the plucked string is converted to sound. The body of an acoustic guitar or violin is more efficient at converting some of that energy into sound. An interesting, very important and almost characteristic feature of the sound of members of the violin family is timbre vibrato, which is largely due to the acoustic response of the body. We see at right that the ratio of the sound pressure to the force that the string exerts on the bridge is a very strong function of frequency, because of the many resonances in the body. (This may seem strange to someone with a background in hifi, where the aim is to produce apparatus with negligible dependence on frequency!). When one plays a note with a particular frequency, some but not all of the hamonics coincide with resonances and so are strongly transmitted in the output sound, while others are weaker. Now consider what happens when the player rocks backwards and forwards the finger that is stopping the string. This produces a pitch vibrato: the pitch of note varies regularly up and down. As it does so, the harmonics of the note also vary up and down in frequency, and so they may move from a strong transmission (due to a resonance) to weak transmission, or vice versa. This means that the spectrum of the output note varies strongly during the vibrato. Perceptually, this makes the sound much more interesting. It is one of the two most important features that help us identify the sound of a violin. (The other is the way in which a bowed note begins.) The key paper on timbre vibrato is by J. Meyer: "On the Tonal Effect of String Vibrato", Acustica, 76� 283-291 (1992). To get an idea of why vibrato is so important to the violin, ask a violinist to play a long soft note on an open string, or two notes simultaneously on two adjacent open strings. On the open string, it will have no vibrato. Now close your eyes? Can you imagine that it is an organ playing? Each time the bow changes direction you can tell that it is a violin, but during sustained, steady bowing it is much less clear. Now ask the violinist to play the same single note, or a double-stopped fifth, on different strings, and to play normally. How important is the difference? We demonstrate this with soundfiles, waveforms and spectra on the page Articulation and vibrato on the violin. The use of the bow is also very important to the violin sound. First, it allows the production of a sustained note, whose loudness can be held nearly constant or, at the performer's choice, varied over time (musicans say 'shaping the note'). There is another important difference between plucking and bowing. A plucked string very quickly loses its high harmonics and, after a few seconds, nearly all of the remaining energy in the string is in its fundamental. Bowing inputs energy continuously to the string and thereby maintains the power in the high harmonics. See Bows and strings. The bow can be used in a variety of different ways to produce different articulations and sound effects. Some of these are demonstrated with sound files, wave forms and spectra on Articulation and vibrato on the violin. Articulation and vibrato on the violin and their importance to the violin sound(s). And finally, yes, we felt obliged to put on our FAQ some comments about that hoary old question "what was the Stradivarius secret? ".